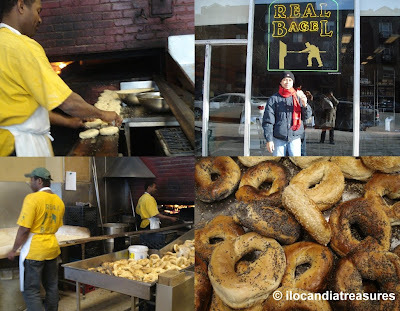 On my visit to Montreal last February, my host Tita Linda took me to a bakeshop called Real Bagel. She bought me a pack of bagels which I tried and took some of it to New York City. According to her, bagel from Montreal has a distinctive taste compared to bagels of other places especially in New York. Bagel is a bread product which is formed into a ring shape. This is usually hand-made and wood-fired baked bread. Typically, it contains wheat flour, yeast leavening, salt and water. However, bread flour or other high gluten flours are preferred to create a bagel that is firm, dense but of spongy shape and chewy texture. Bagel is derived from the similarly shaped doughnut. The bagels with poppy seed (black-seed) and sesame seed (white seed) were the varieties that I saw in the bakeshop. These are the predominant varieties. Other varieties of bagel are salt, onion, garlic, egg, cinnamon, raisin, chocolate, cheese and others. They also make it into a bagel sandwich which they put some luncheon meats. Bagels with cream cheese and cured salmon are considered as traditional American Jewish cuisine. Other shapes also exist such as the square one. It is called squagels. Flat bagel is called flagel. There is also pseudo-bagel which the hole does not go all the way through. Bagel originated from the Jewish community. "Bagel" comes from a Yeshivish term which means 'one who sleeps 12 hours straight'. This is in reference to the fact that bagel dough has to "rest" for at least 12 hours between mixing and baking. They pronounce it like bay-gel in Canada and vary to other places. When I got my first bite of the freshly baked bagel, I proved that it really has that distinct taste. It’s chewy and yummy. It is truly the real bagel.